I have a confession to make. I doubled the below recipe and the second batch of brownies (without the cheesy top) ended in an un crispy, dry, burgundy disaster! I'm sure, if I hadn't of doubled this innocent, sweet and delicious (never done anything to upset me) recipe, then all would have ended in chocolatey bliss. 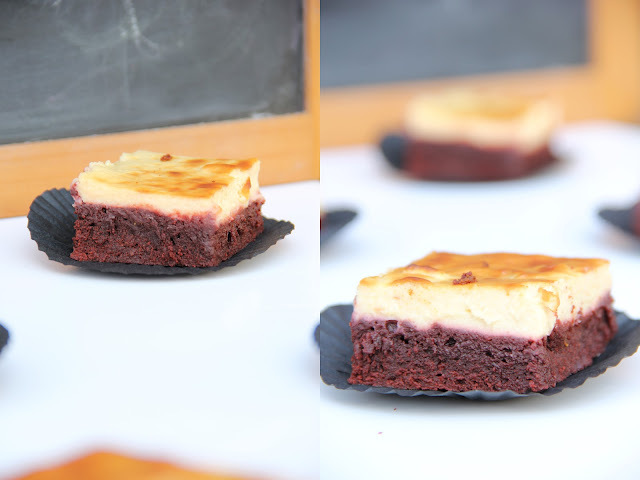 But what really interested me is that the cheesecake topping had moistened the burgundy brownie substantially, which added a nice little touch to the better batch of the two! All of you don't happen to be wondering wondering why I made these. So I made these this week because apart from working, I've spent quite a bit of time at home, on the Internet, browsing....admiring everything on foodgawker. And why have I spent more time then usual doing this, which subsequently caused me to make a horrendous batch of brownies? Cos I can no longer drive. That's why. And it's absolutely killing me. On the plus side, it means you get to see more on mbakes! Woo! Anyway, must dash, work experience at Goodtoknow starts tomorrow. Still got to pluck my eyebrows and wax my tash! Wish me luck! Line one 8 inch square tin with parchment paper and preheat the oven to 180 degrees celsius. In a saucepan, melt the butter on a low heat then add the chocolate. Keep stirring until all of the chocolate has melted. Take the mixture off the heat and whisk in the cocoa powder until smooth. At this point you can either transfer the mix into a freestanding mixer or leave it be. Add one egg at a time, consistently mixing. Then the vanilla, sugar and lastly the flour. Add the food colouring last. Mix till well combined. Plop all of the brownie batter into the prepared tin and spread around well. Set aside. Make the cheesecake layer with an electric whisk or mixer. Cream the cream cheese till smooth and add the egg yolks one at a time. Lastly the vanilla - add to your preference. Gently smooth the mixture on top of the settled brownie using an offset (cranked) spatula. Bake for 40 minutes or until the cheesecake topping is a healthy golden brown. When it's baked, leave to cool in the tin so it keeps it's shape. Enjoy and refrigerate when not in use! PS. Sorry for all of the painfully similar pictures! Budding awful photographer over here! Lovely pictures. This is just to die for.